A great addition for the “ultralight backpack hunter.” Weighing in at only 7.5 ounces the micro pan head will hold most binoculars and spotting scopes up to 65 mm perfectly still. Sitting to glass with your tripod in some country can be difficult. 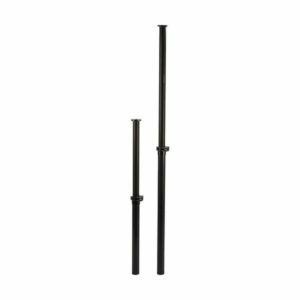 The Outdoorsman has provided you with the best of both worlds with their center post extension for their medium and long tripods. Extremely lightweight, the extension will provide you with an additional 17-34” of elevation so that you can comfortably stand to glass. I’ve use my Outdoorsman medium tripod with either their traditional pan head or pistol grip head for years. I have absolutely loved the ultralight flexibility and outstanding performance they have given me out on the mountain. When the Outdoorsman came out with their remarkable engineered Micro Pan Head several years ago and a center post extension I knew they had hit another “home run!” I didn’t get around to using either one until this spring. Wow, have I been impressed! The micro pan is an incredible addition to any lightweight hunters gear as it weighs an amazing light 7.5 ounces yet performs at a championship level. 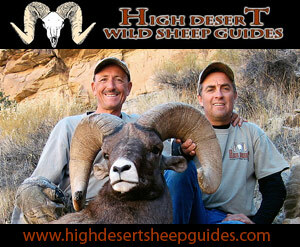 Since most of the sheep hunts I guide here in Utah are backpack only I try to “shave” every ounce I can in weight. The Outdoorsman micro pan head holds my Swarovski 15 x 56 binos and STS 65 mm spotting scope secure and firm while glassing, even in windy conditions. It enables me to swivel and pan smoothly while “gridding a hillside” yet locks up extremely well with I want to focus in on a big ram, buck or bull. In regards to the center post extension to my medium tripod, I have been extremely happy as the extra17-34” inches now provide me with enough height to glass comfortably from a standing position in terrain that is not conducive to sitting. Outdoorsman Micro Pan Head on Medium Tripod with Center Post Extension. Has been an incredible combination for me! Allows me to stand to glass when necessary! I personally have never had an issue with any Outdoorsman product over the years and have found their Customer Service to be outstanding! I’ve attached for you the Outdoorsmans Policy on returns, etc. 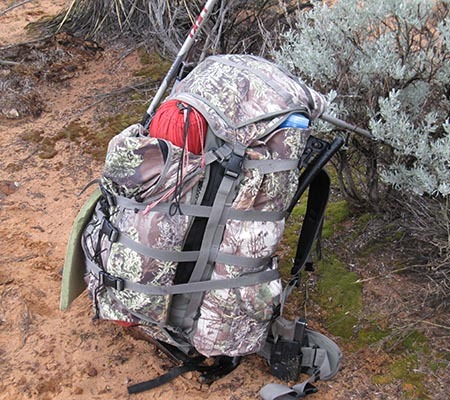 If you are not entirely satisfied with your Outdoorsmans purchase, we will make sure to work with you to the best of our ability to correct the issue. 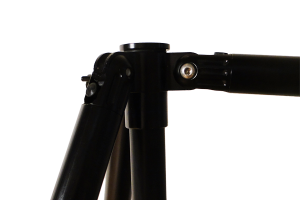 	All Outdoorsman’s Tripods are 100% manufactured aluminum. The only plastic on these tripods are the small twist knobs that I’ve never had an issue with. These tripods just don’t have parts that might break, bend or malfunction when you are out on the mountain glassing for trophy animals. 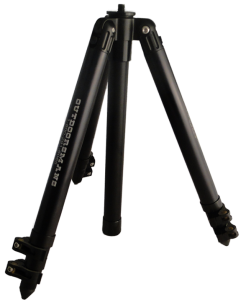 	Your investment in an Outdoorsman’s Tripod makes great financial sense, as these tripods will last forever even under the toughest of conditions. 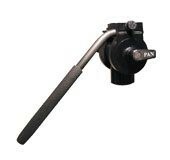 	Lever lock legs allow for quick and easy adjustment to your desired tripod height. The new Compact Medium Tripod has two lever locks as does the Tall model while the Short and Medium tripods feature one. 	The yoke of the Outdoorsman’s Tripod allows for easy connection of any of the aluminum Outdoorsman’s Tripod Accessories. 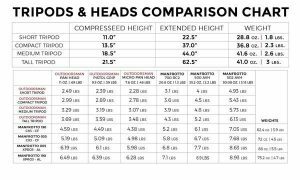 	Outdoorsman’s engineering reduces vibrations compared to other carbon fiber tripods of this weight class. 	Each leg has a full range of motion, allowing you to set your tripod up on even the most difficult angles in treacherous or uneven terrain. 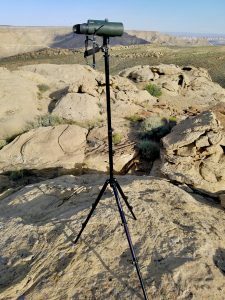 	My tripod must be light but very strong and sturdy so that it will keep my 15 x 56 Swarovski optics and large spotting scope steady in windy conditions or on rough, uneven terrain. 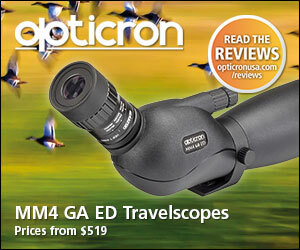 At 2.1 lbs the Outdoorsman Compact Medium tripod meets this criteria. 	It is absolutely essential that I have a tripod that is easily adjustable to different heights so that I can glass from prone, sitting or kneeling positions. The clever, lever locking legs and extendable center post on my Outdoorsman Compact Tripod allow me to quickly and efficiently adjust to varying heights for glassing big game animals. This little tripod will compress to 13.5” or extend to 36”. Extremely beneficial. 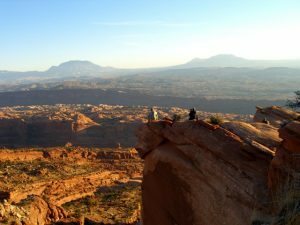 	The inhospitable canyon country and high desert terrain of southern Utah that I guide sheep hunters in is very rugged and convoluted. This type of terrain forces me to glass from ledges and landscape that is tough to maneuver around in. To utilize my optics I need a tripod whose legs will adjust to very unique angles. With the Outdoorman Compact tripod, the fully adjustable lever locking legs give me the full range of motion required so that I’m able to glass from the most difficult of angles with total comfort and ease. 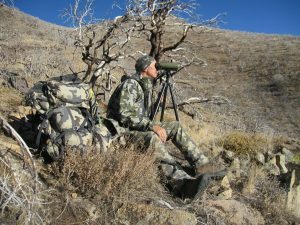 	Because time and efficiency are so important to me while guiding for sheep or other big game animals I can’t afford to lose an opportunity to lock my optics onto my tripod quickly. 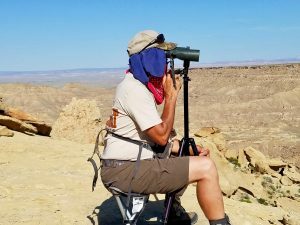 It is also equally essential to have the capability of disconnecting and interchanging my binos with my spotting scope to accurately judge rams out in the field. The Outdoorsman Mounting System is absolutely perfect for this need. With my Compact Medium Tripod I have an Outdoorsman’s Tripod Adapter, plate and stud that function perfectly with the Swarovski 15 x 52 optics and 65mm spotting scope I use. 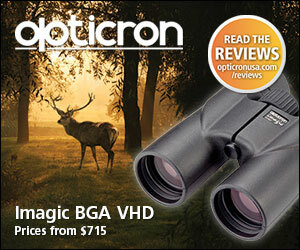 It is simple to slip both my binos and spotting scope on and off smoothly. I can also connect my camera, digiscope system and range finder to this tripod when needed. 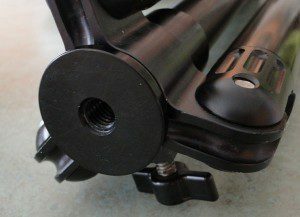 A dove tail plate on the bottom attaches to the tripod head. My quick release adapter slides into the dove tail and with the simple turn of a twist knob it is secured. 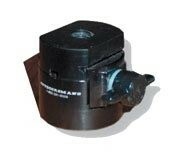 The hole near the top of the adapter has been engineered for the binocular stud unique to your optics so that it will slide in with a click. 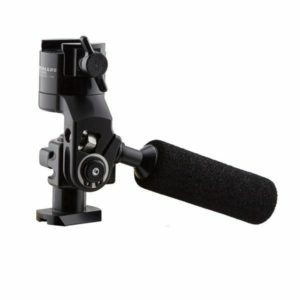 You can tighten the adaptor with several quick twists and you are in business with a steadfast, secure tripod mount. 	Because I sometimes glass for hours at a time the last requirement that I have in a tripod is that the head must move fluently both horizontally and vertically. In other words, I must be able to adjust my binoculars or spotting scope up, down, and sideways. This movement cannot be jerky or you will miss picking up the twitch of an ear or the top of an extended horn on a ram, bull or buck. This is why I chose the Outdoorsman Panhead to go on the Compact Tripod. 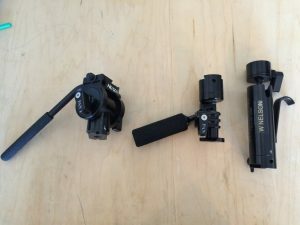 This incredibly lightweight tripod head is as good as anything on the market. The head has separate levers to control the vertical and horizontal travel of my optics. It also has specifically been designed to accept the Outdoorsman’s Adapter Plates that I spoke about earlier. It should be noted that when I’m glassing from a very steep incline or cliff that this pan head will hold my spotting scope with a video camera attached rock solid. 	I’ve put my tripods through hell and earlier on with my older long and medium tripod had a few issues with the rubber boots on the legs coming off when glassing in deep sand or muddy conditions. Now, that problem has been corrected as the boots are seated much deeper into the legs of all their tripods. 	I would recommend that the Outdoorsman find a way to better secure the rubber cover on the end of the center post. Normal hunters may not have an issue with this but I have had this cover pop off with my rough handling.